Keeping chips from getting crunched while being stored in your house can be a challenge. It’s especially frustrating to have an opened bag of chips get lost in the back of a cabinet or shelf until it’s too stale to eat. I have throwing away food. I recently came up with a solution that’s working well for us. We have a pantry with some shelf space and also a little unused wall space. This little bit of wall space was just big enough for hanging chip storage. Using heavy cotton yarn and a suitable size crochet hook (the yarn label should have a recommendation – I used a size I hook with Sugar ‘n Cream® yarn), crochet a chain about the length you want the finished chip holder to be. Turn and single crochet in each chain stitch. Chain one and turn, then single crochet in each single crochet. Repeat until you have the width you want or about a 1 ½ to 2 inch wide piece. Bind off. This is the backing for the chip holder. Fold down the top 3 to 4 inches and sew, crochet, or tie securely in place. 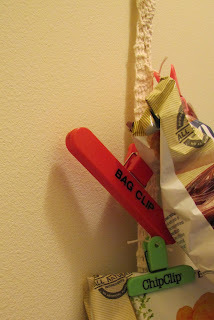 This makes the loop you will use to hang the chip holder on the wall on a hook or nail. Cut several 12 inch pieces of the cotton yarn, then use each piece to tie chip clips securely onto the backing about 4 to 6 inches apart. Trim excess ends about one inch from each knot. Now it’s ready to hang and add chip bags. I especially like that the chip clips are tied down so that they don’t disappear. For more great ideas, visit The Idea Room Linky Party 5. This won't work for me because I don't really have a pantry, but if I did I'd be all over the idea. I'm an artist specializing in graphic art, fiber arts and waterolors. And I'm a gluten-sensative food lover with a background in culinary science and product development within the food processing industry. Cindy Tabacchi. Simple theme. Powered by Blogger.